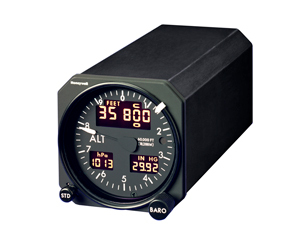 The durable AM-250 is an electronic altimeter designed for use in new or retrofit aircraft applications. These customizable cockpit gauges are one of the components needed to meet the FAA's Reduced Vertical Separation Minimum (RVSM) flight requirements. Our altimeters are equipped with innovative features designed for aircraft that require modern, accurate and reliable altimeters with enhanced air data outputs.